With voluntary labour stretched to the limit there are numerous items up and down the Railway that become neglected through necessity. The Railway has received criticism from some quarters that the goods wagons on display around the turntable at Keighley do not present the best of images to the outside world. One of the items is tanker wagon A5066, illustrated above in a woebegone condition earlier this year. A5066’s fortune,s however, have now taken a turn for the better and it was recently taken up to Oxenhope for a rebuild and spruce up. 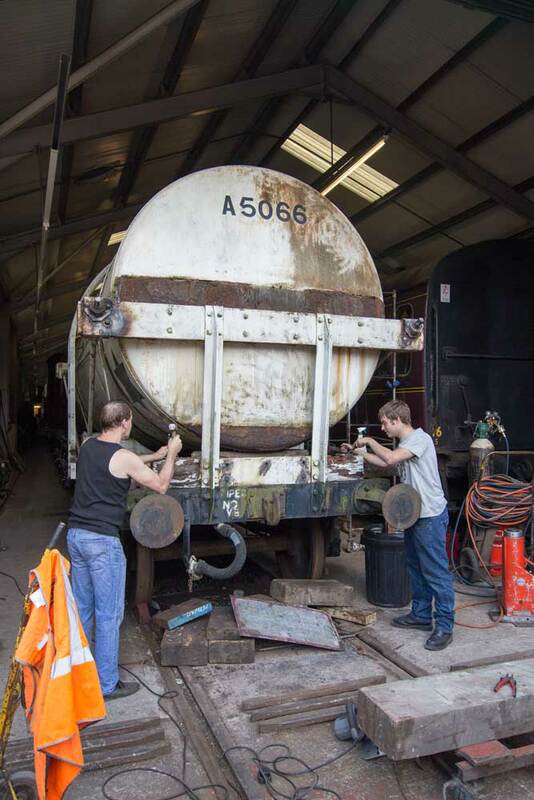 In the accompanying picture Peter Eastham and young colleague are seen commencing the rebuild, after the tank had been jacked up off the frames. Whether in the future the tanker can take its place in the demonstration freight train is yet to be seen, until the extent of the work required is established and whether full restoration is feasible. LNER saloon 21661, more famously known as the Old Gentleman’s Saloon in the Railway Children film, is arguably the oldest operational standard gauge passenger coach in the world and seats just 14 people. Being of a venerable age the old carriage shows her age from time to time and has been showing signs that all is not well. Last week it was lifted off its bogies to allow removal of a drawgear spring for overhaul and a general inspection of the undergear and underframe. 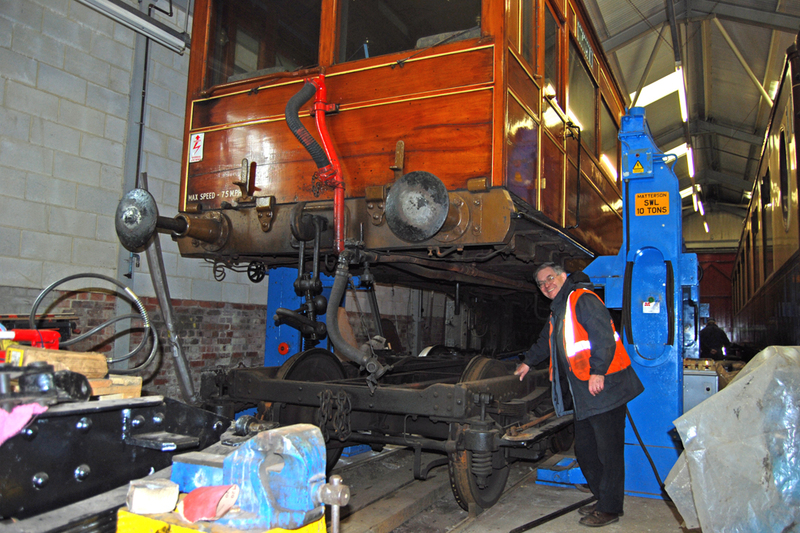 The ride height of the coach at the other end is to be adjusted when the spring has returned from overhaul. The image shows, owner Chris Lawson inspecting the underframe and his smiles suggest he is not too unhappy with the outcome. Very much unsung heroes of the Railway, how many of us take for granted the “modern” rolling stock we travel on when we visit the Railway. However beavering away in the Oxenhope former goods shed are a dedicated team, led by Peter Eastham, who keep the running fleet serviced whilst at the same time overhauling previously active members of the fleet that have been in the queue for attention. We hope to keep followers of the site up-to-date with what is happening in the depths of Oxenhope goods shed.